This photograph displays Tokyo’s most popular transportation modes during the Meiji Period (1868-1912), horse drawn streetcars and jinrikisha (rickshaws). A small family is stepping out of the streetcar, most probably on their way to visit the new Ueno Park, a favorite attraction during this period. The area first became popular for recreation when the First National Industrial Exposition was held here in 1877 (Meiji 10). During the 102 days that the exposition was held no less than 450,000 people visited buildings housing 16,000 exhibitors themed around machinery, horticulture, and farming. Because of Shinobazu Pond (不忍池) with its lotus flowers, and the park’s many cherry trees, as well as other flowers, it attracted families and revelers year round even after this exposition. It was especially popular for hanami, the viewing of cherry blossom in Spring. 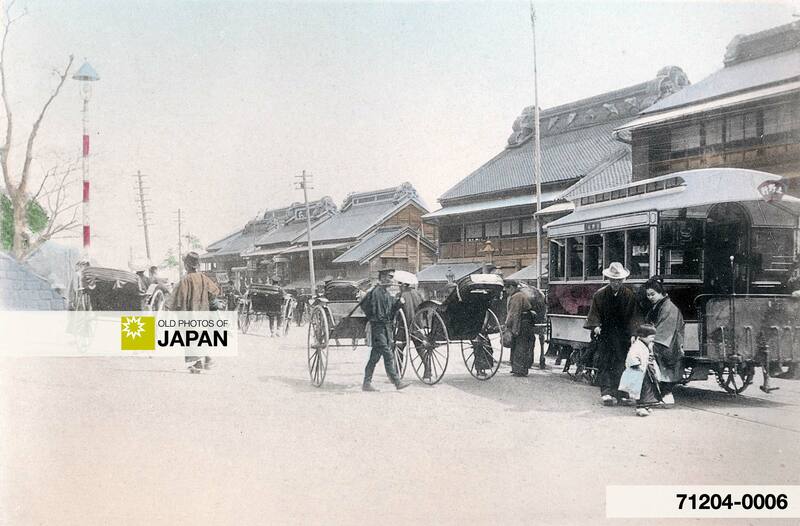 Click here to find more information on, or images of, streetcars on Old Photos of Japan. You can also licence this image online: 71204-0006 @ MeijiShowa.com. Thank you so much for making this website with beautiful pictures and interesting information. Good design, good the colors, awesome concept, excellent photos.